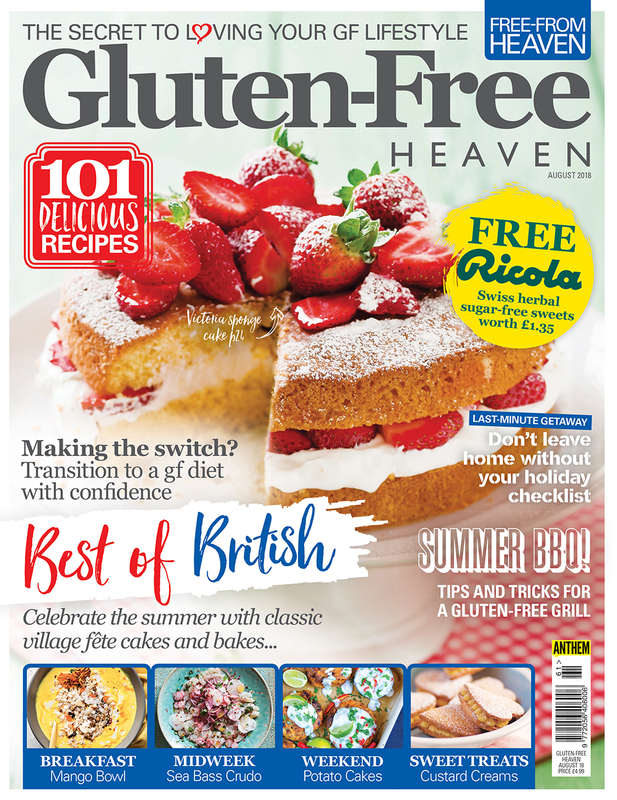 Welcome to the latest issue of Gluten-Free Heaven, packed as always with 101 delicious and seasonal recipes, news, products, features, Q&As and much more. This issue we pay homage to Great British village fete classics such as scones, the Victoria sponge, flapjacks and sticky toffee pudding – we could go on! Also this month we look at how to combat the fussy eater, learn how to host the perfect gluten-free barbecue, see how to transition to a gluten-free diet, put gluten-free sweets to the test, make eating gluten-free healthy and, for those thinking of a last-minute holiday, provide you with an essential travel checklist. We know you’ll enjoy the free packet of Ricola LemonMint sweets we’ve got with this issue too, perfect for sucking on while digesting all the fantastic recipes we have this month! We hope you enjoy the mag as much as we did putting it together! Pick up your copy of Gluten-Free Heaven at Asda, Morrisons, Sainsbury’s, Tesco, Tesco Extra, Waitrose, M&S, WHSmith and Easons, or order online from us here. You can also download the digital edition here.